The scrotum. On the left side the cavity of the tunica vaginalis has been opened; on the right side only the layers superficial to the Cremaster have been removed. 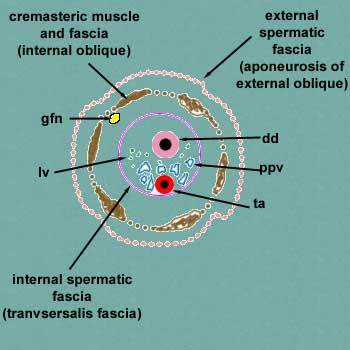 The internal spermatic fascia (infundibuliform fascia) (Le deuxième fascia de Webster) is a thin layer, which loosely invests the spermatic cord; it is a continuation downward of the transverse fascia. Schematic drawing of a cross-section through the vaginal process. Anatomy figure: 36:01-16 at Human Anatomy Online, SUNY Downstate Medical Center - "The inguinal canal and derivation of the layers of the spermatic cord." This article related to the genitourinary system is a stub. You can help Wikipedia by expanding it. This page was last edited on 16 April 2018, at 15:22 (UTC).